"Are you hip to the munk?" Gone are the days of stuffy travel agency oligopolies. 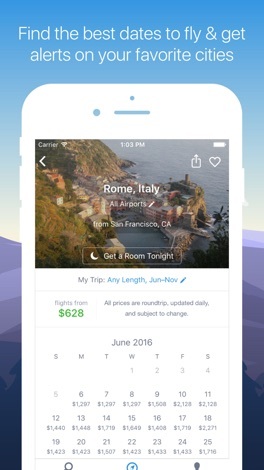 The modern savvy traveler knows to shop around, and the best way to do that is through an app that lets you search and compare many different options for flights and hotels at once. 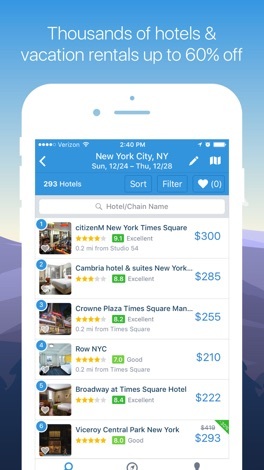 Hipmunk Hotels & Flights is one such app, and a nice one too. Enter in your desired details (destination, arrival/departure dates, how many people, etc.) 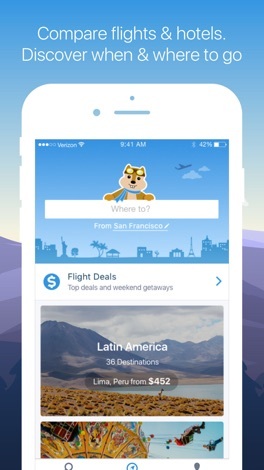 and Hipmunk will get to work on a personalized search. During the wait time, you get to check out a very cute chipmunk grooving as though it were an airplane, which is a sweet plus. The results screen consists of colored blocks on a timeline representing possible combinations of flights, a translation from the display used on the Hipmunk website. These can be ordered by traditional factors like price and number of stops, but also, usefully, by "agony." Let's face it, that's what we're all really attempting to minimize when we travel - so the least "agonizing" flights have the best combination of low prices, few stops, and non-extreme departure/arrival times. Nice! A few extra pluses Hipmunk offers over its competition: AirBnb and Homeaway rentals are available as results on the "hotel" search feature, something I haven't seen anywhere else. There are also "tonight only deals," which can offer last-minute discounts of up to 60% if you love flying by the seat of your pants. And a few negatives: the time-based comparison might be rather strange if you've never used the Hipmunk site, and the small screen on your device is probably not the best way to familiarize yourself with them. You also must choose the first leg of your journey before seeing the possibilities for the second, which just isn't convenient for planning some trips. 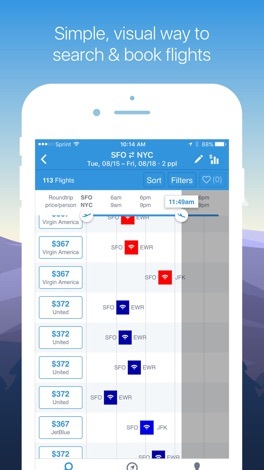 There are fewer features than some similar comparison apps (for example, it lacks a flight tracker). Finally, there is no option to select "anywhere" as a destination, which I've always loved as a feature of certain flight search engines. 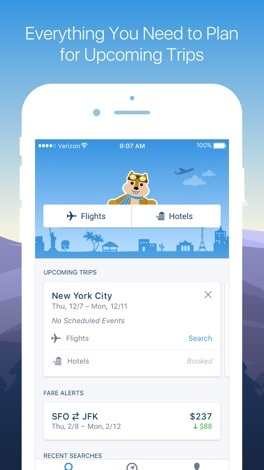 Hipmunk Hotels & Flights is more than fairly decent, despite glossing over a few things I'd put in my ideal flight/hotel search app. And that flying chipmunk is legitimately adorable.